The Max Planck Society (MPG), an independent, non-profit German research organization and ScienceOpen, the research + Open Access publishing network based in Germany and the USA, have signed an agreement (official PR) that will allow authors affiliated to MPG as members of one of its 82 institutes and research facilities, unlimited free publication of posters and research articles in 2015. 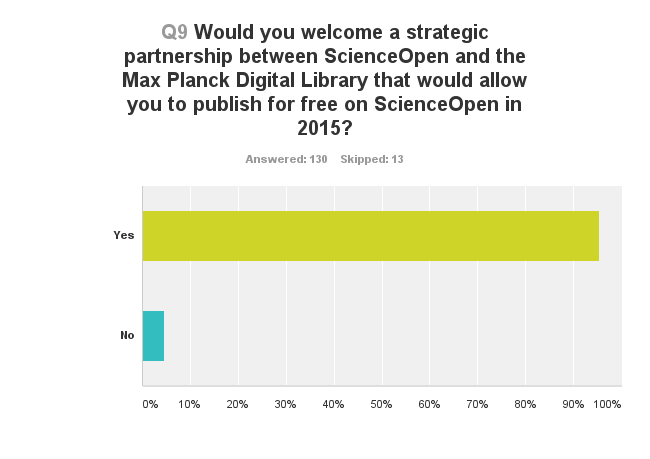 Following the Max Planck Digital Library OA Ambassadors Conference, ScienceOpen fielded a short survey to some MPG researchers (143 completions) to gauge their likely support for this partnership. The feedback was overwhelmingly positive – 95% of respondents said that they would welcome a collaboration between MPG and ScienceOpen. Other encouraging signs from the survey included nearly 90% of participants who were willing to publish in a journal that offers Non-Anonymous Peer Review after publication and 86% who don’t believe that Impact Factors are a good method to evaluate the quality of individual articles and authors. We also want to take a moment to acknowledge and thank those working at the MPG from our Editorial Board for their support. They include the following researchers, feel free to reach out to them directly for more information about the publishing process at ScienceOpen. 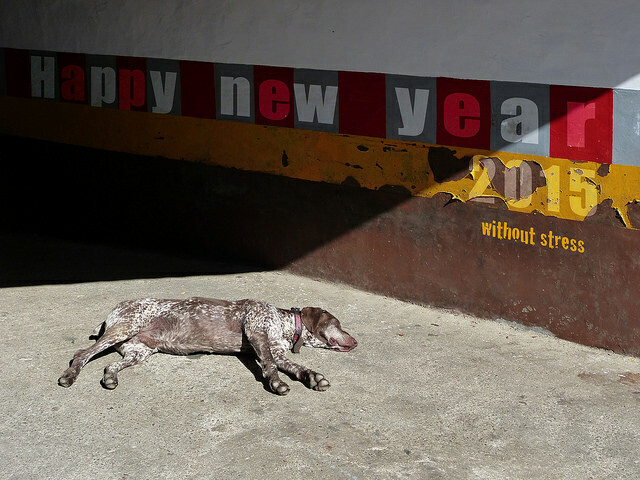 ScienceOpen CEO, Stephanie Dawson, said “all of us at ScienceOpen are delighted to end our year on such a positive note by establishing this important relationship. We look forward to a productive 2015”. If your society or organization wishes to make a similar arrangement with us, please email Liz. It may be the beginning of the Holiday season, but here at ScienceOpen we’re already looking forward to our speaking engagements in 2015! First up, co-founder Alexander Grossmann, Physicist, Publisher and Professor, is going to be participating in a session on “new publishing developments” (venue, NH Hotel Berlin Mitte) on Monday 19th January between 3.30 and 5pm. The agenda for this “pre-conference day” is particularly relevant to us. Here’s an excerpt taken from the conference program so that you can see why: “Open Access has changed a lot within scholarly publishing. One thing that is often overlooked is the fact, that it required academia to become much more actively involved in the publishing process. This has created both a new way of thinking around publishing as well as a number of very interesting start-ups. The APE 2015 Pre-Conference Day will look at the “What is Next” for our industry”. As many of you know, we’re on a mission to “democratize publishing” and have Community Editor roles available for researchers, appointed by our Editorial Team, which give them the ability to curate, commission and manage content in their own article Collection or Mini Journal. In return for their expert knowledge and effort, we offer a modest stipend ($1500) that can be put towards travel to attend conferences that are particularly relevant to their field. We welcome applications for these roles. Reviewing the program in detail did make us smile however. There’s a session on Wednesday, at 8.30am, entitled: Wake-up Session: how to make money with Semantics, moderated by Richard Padley, CEO, Semantico, Brighton. All we can say is that we hope someone remembers to have the coffee pot on for Richard and that the topic of “making money” makes his audience suitably jazzed! The recipe for our (not so) secret Post-Publication Peer Review sauce! It seems that nearly every day there’s a new online conversation about Post-Publication Peer Review (PPPR). We participate in nearly every single one because PPPR is a hallmark of what we do at ScienceOpen. Co-founder Alexander Grossmann (Physicist, Publisher, and Professor of Publishing Management), has posted on this topic many times, including this popular piece which traces the roots and flaws of the current system entitled “where did our Peer Review Mojo go?“. It’s probably true to say that over the course of my career (PLOS & Nature), I’ve experienced many permutations of research communication but the one that I like the best is the one we offer at ScienceOpen. Before I joined in May, the team here had quietly developed a unique and smart way to make PPPR work. We publish articles with DOI within about a week after an initial editorial check – we don’t publish everything that we receive. We provide proofs, basic copy-editing and language help during the production cycle – if you think all OA publishers offer this, you’d be wrong! We facilitate Non Anonymous Post-Publication Peer Review (PPPR) from experts with at least five peer-reviewed publications per their ORCID to maintain the level of scientific discourse on the platform. We believe that those who have experienced Peer Review themselves should be more likely to understand the pitfalls of the process and offer constructive feedback to others. We give all reviews a DOI so they can be found and cited. We have methods for our editors to alert readers to any content problems – thankfully, we’ve not had cause to use them. We have versioning for authors who wish to respond to review feedback and revise their article. You might think that running a publishing platform built around PPPR would keep us awake at night worrying about fake reviews and identities but oddly it doesn’t. We agree with Anurag Acharya, the co-founder of Google Scholar who stated in a recent Nature interview that when everything is visible, under your name, you can be called on it at anytime, so why risk ruining your reputation? Additionally, ORCID also has protections built into their system. We think the ScienceOpen approach might just be the next wave of OA and there are some who agree with us. These include the experts on our Editorial and Advisory Boards such as Peter Suber, Stephen Curry, Anthony Atala, Bjorn Brembs, Raphael Levy, Philip Stark, Nick Jewell and many others. But, what really convinces me that PPPR is the way forwards and that our method is going to give the community enough confidence to make the switch are the experiences of our authors. It’s easy to ignore yet another innovative organization telling you why their approach is the best but the voices of the community are always the most compelling. PS If you have an article that you’d like to publish before the end of the year, there’s still time to do so with us.